The use of our editing and proofreading services has saved numerous companies and individuals time and money. Here, you'll find client case studies highlighting several such solutions and cost savings. Are you a current client who would like to be featured in our case study program? Please use our contact form to apply. BayGroup International is a global performance improvement firm whose main goal is to help corporate leaders reach critical business goals quickly and profitably. As a loyal customer, BayGroup International has seen cost savings and increased efficiency by outsourcing its editing and proofreading needs. To see how BayGroup International has saved time and money by using our services, please read the BayGroup International Case Study. Prose Solutions is a full-service content development and consultancy firm based in the United Arab Emirates. The company offers copywriting, editing, and proofreading services in both English and Arabic. Demand for the services of Prose Solutions is variable, and when Managing Director Dave Grunfeld received a commission that exceeded the company's capacity, he didn't want to turn it down. Grunfeld outsourced his editing requirements to Scribendi and delivered the project to his customer on time and on budget. For more details about the commission, please take a look at the Prose Solutions Case Study. 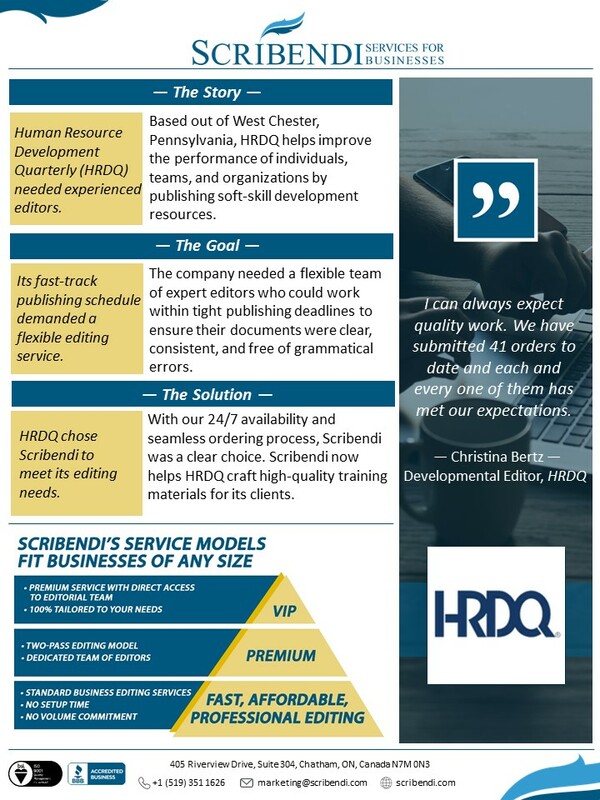 Human Resource Development Quarterly (HRDQ) is a publisher of soft-skill developmental resources for individuals, organizations, and teams. The company needs experienced editors who can keep up with its fast-track publishing schedule. To understand why HRDQ uses Scribendi for editing, please read the HRDQ Case Study. Tammy Wilkinson is a published author who recently wrote Blood of the Ancients, a book about a romance between a vampire and a human. She struggled with finding the perfect editor for her manuscript, and after much research, she chose to outsource her manuscript editing to us. For information about how our editor's revisions and comments helped Tammy publish her novel, please read the Tammy Wilkinson Case Study. After retiring from a career as a CPA, Michael Bivona turned his hand to writing and publishing. Michael had already written a non-fiction guide to accountancy, but he wanted to focus his new writing career on his experience as a retiree and impart advice to others in similar situations. When he completed his manuscript Traveling Around the World with Mike and Barbara Bivona, Bivona turned to Scribendi to get the book edited. Bivona has exacting standards, and as a former accountant, he knows that attention to detail is essential. Read more about the project in the Michael Bivona Case Study. Roman Krzanowski is a published author with a Ph.D. and over 20 years of network design and IT experience. His latest book, The Tao of Network Design, provides 30 rules of network design based on principles the author has come to understand after years of working with network services and different network architectures. For information about how one of our experienced technical editors helped the author get this book published, please read the Roman Krzanowski Case Study. Andrea Stein is an Amazon bestselling author, specializing in romance and suspense novels. Her most recent success, Rough Harbor, has been described as a contemporary romance novel with a twist. She struggled to find an experienced romance novel editor that could meet her desired turnaround time. For information about how one of our seasoned romance novel editors helped Stein polish her work, please read the Andrea Stein Case Study. Guiditta Cordera-Moss is a professor in the Department of Private Law at the University of Oslo. Cordera-Moss has published over 50 scientific articles, book chapters, and books. For several years now, our expert team has consistently provided this loyal customer with superior-quality editing. For more information about how our academic and manuscript editors have helped the professor meet rigorous standards, please read the Guiditta Cordera-Moss Case Study. As a novice author, Robert Wagner knew he needed an editor for his first novel—The Cardslinger: Memoir of a Casino Dealer. He wanted a professional who could help him navigate the publishing process and offer suggestions to ensure that his manuscript was the best it could possibly be. 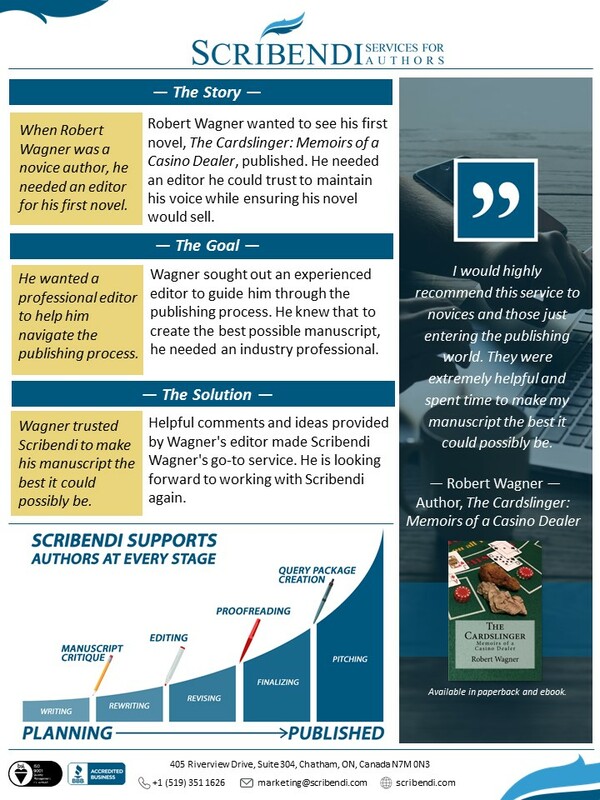 To see how a Scribendi manuscript editor helped Robert achieve his dream, please read the Robert Wagner Case Study.